When I was in the UK, I came across this unusual variety of Rice Krispies (called Rice Bubbles in Australia) as one of the cereal choices at our hotel breakfast buffet. Maybe someone can enlighten me on whether this new “multi-grain” flavour is available in other countries. I forgot that I brought this box of cereal home so it sat in the back of a cupboard for a little too long and when I finally decided to eat it, it was a bit stale but the texture and taste was a little bit surprising. 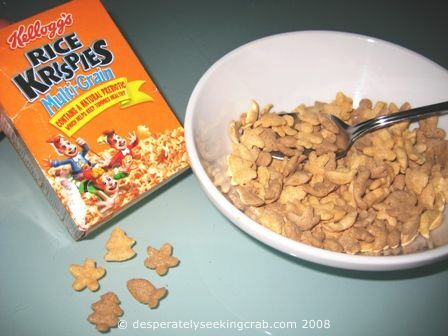 It was sort of like eating lightly sweet puffy cardboard – nothing really resembling the original Rice Krispies except for them being puffed. It’s great that it contains some natural prebiotic (probiotic) but I imagine that yogurt is probably a better and tastier alternative to make kids “tummies” healthy. Although processed, I think that it’s still better than the super sugary cereals with lots of food-colouring in it (you all know what I’m talking about).